In 1941 Jaldapara Reserve Forest has been grown up.In Jaldapara,there are tiger,elephant,leopard, dark, peacock, sambar,boar and many other animals. The chief sight is one horned rhino .Here tourists can ride on the back of elephant to see the jungle and wild animals activities. 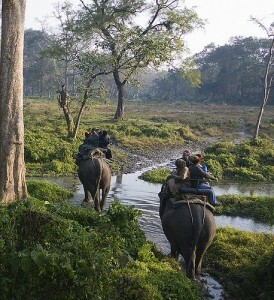 In this forest river Torsha and Malangi flow by from east to west.There is salt thick on the river bank,the animals come to lick the salt and to quench their thirst.Leopard Rearing Centre is there.To stay, there are Bungalows surrounded by green scenery.Best season for tour is from oct-may. Air:To reach direct from Kolkata to Jaldapara, reaching Bagdogra by plane.From Bagdogra take bus or private cars. Rail:Trains are ply from Kolkata to NJP.From NJP take bus or private cars. Road:Regular bus service from Jalpaiguri,Siliguri,cooch Behar,Jaigaon. This entry was posted in Jaldapara Reserve Forest, West Bengal. Bookmark the permalink.